Record Description Among the items listed in the 1852 catalogue of the Yorkshire Museum in York was â€œSeveral specimens of silvered horse furniture, ornamented with slightly engraved patterns. Found on Fremington Hagg, near Reeth in Swaledale. Presented by Capt. Harland.â€ (Wellbeloved, Rev C: Descriptive account of the antiquities in the grounds and in the museum of the Yorkshire Philosophical Society, 1852). Horse furniture is a rather curious phrase for harness fittings. The donor was presumably Captain John Harland (1788-1875), the famous dalesman, soldier in the Napoleonic Wars, chairman of the Reeth Poor Law Union, and compiler of the Glossary of Swaledale Dialect Words (Cooper, Edmund: A History of Swaledale, 1973, p67). The first comprehensive published analysis of the find was written in 1971 by G A Webster (A hoard of Roman military equipment from Fremington Hagg, in Soldier and Civilian in Roman Yorkshire, ed. R M Butler, 1971, p107-126). He explained that another reference to the find placed the date of it at least 19 years before the catalogue listing, and it also seemed likely that the Yorkshire Museumâ€™s collection of harness fittings was either the result of two separate donations of items from the same find, or from more than one find, or even a combination of both. 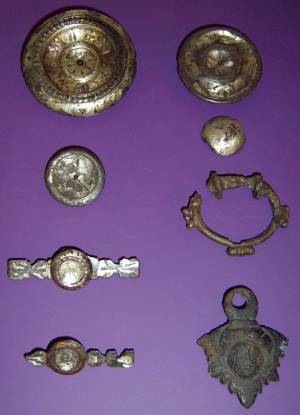 Webster identified 75 pendants, roundels, strips and studs that he felt were likely to have belonged to the original hoard, and noted that seven of these had been given to the British Museum in 1880. As a consequence of Webster's article, the British Museum conducted a detailed scientific analysis of comparable samples from the London and York collections to test whether they did in fact belong to the same hoard. The results were published in the British Museum Quarterly, vol. 37, summer 1973, and confirmed that the metal compositions were so similar as to suggest "that not only were they cast in the same workshop, but also from the same crucible of metal." Webster dated the fittings to before 69 AD, i.e. before the completion of the Roman conquest of this part of the north. He surmised that the hoard was probably the enterprise of a looter from the equipment of Roman cavalrymen who had been sent to quell a local revolt. Nothing more is known about the date, location or circumstances of the find. 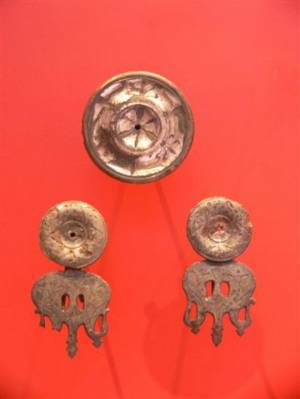 Currently three of the fittings are on display in the Yorkshire Museumâ€™s permanent exhibition, in case 13 of the Roman section (see photo 1 below) where they are described as â€œcopper-alloy harness mounts decorated with silver gilding and niello.â€ A selection of the fittings that remain in the museum's storeroom are shown below at photos 2 and 3. Image 3 Description Fremington Hagg harness fittings from the storeroom of the Yorkshire Museum (copyright York Museums Trust). 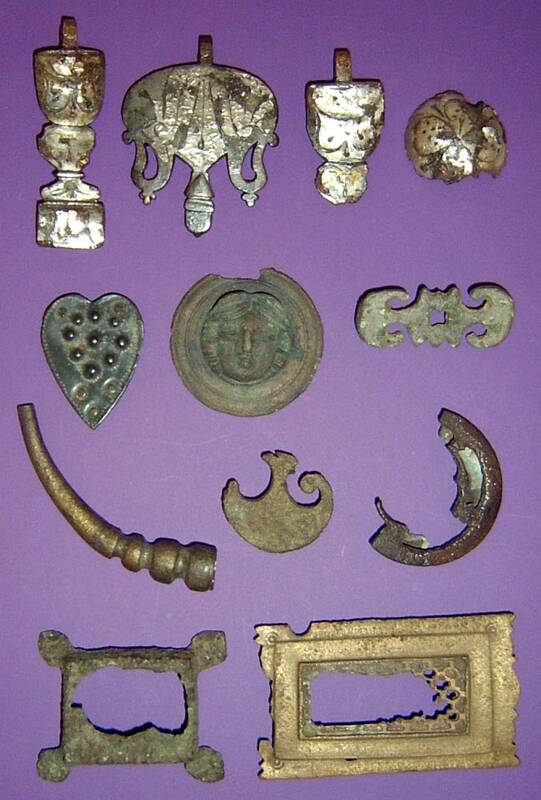 Most are silvered copper alloy. The item at second row centre features a female face. At third row right is a scabbard fitting called a chape.